OK, I was able to sneak in this card while my parents nap (seriously, they're passed out in my living room):) This time I took my challenge inspiration from PTI DT member, Dawn McVey! I love that Dawn embraces saturated color especially hot pink (my favorite)! This card includes all kinds of PTI goodness including a stamped background with Rosie Posie hexagons and Mat Stack 5 flowers. I also handmade a rosette with chevrons! 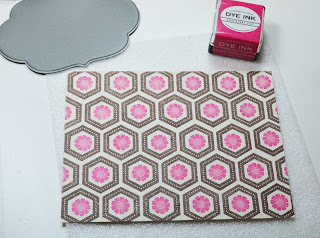 My inspiration from Dawn came from the Rosie Posie set and the pink/red/brown color combo. I also "borrowed" a technique from Maile and Dawn and colored the rose with a Copic. This is probably my last card for the day but then again, there's always half-time;) Thanks for visiting! I love how you used the little flower in the center of the honey comb! I am commenting on all your last few posts--they are absolutely gorgeous. You guys have been super busy. I think this last one is my fave. 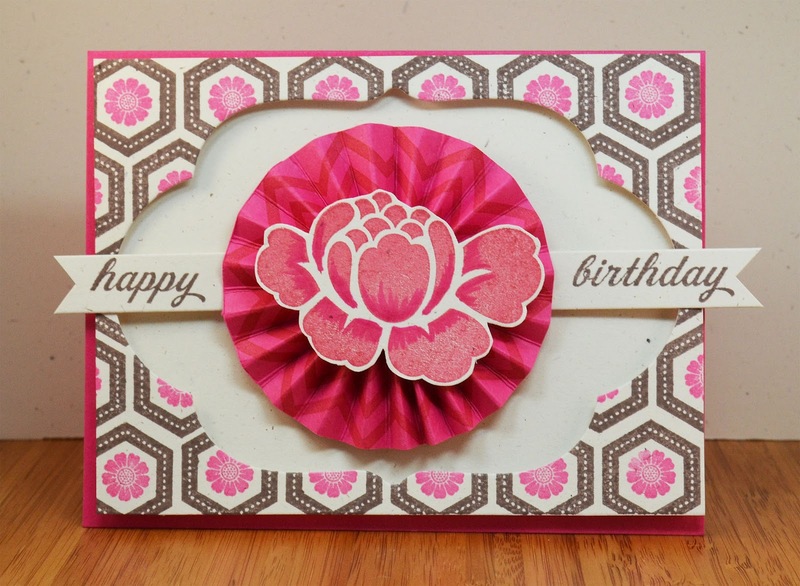 Love that chevron background, and how you popped that rose up on a rosette. You are the queens of rosettes! 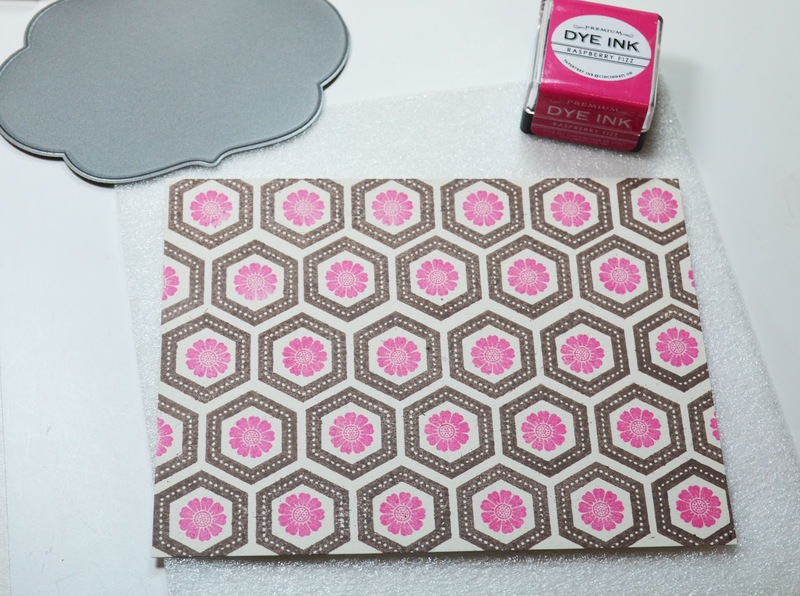 Beautiful card- great stamping and copic colouring with the Rosie posie set. OK, I guess that's the problem with retired people time...by the time regular people time catches up, they're sleepy ;) Yay for extra crafty time, though :) Love the banner and once again, all the dimension of the recessed frame & that awesome rosette! What a gorgeous card! I love it! This is such a beautiful card. I love your use of Rosie Posie-the flower and the background. Well done. Wow JJ Hand stamped paper! Looks fantastic!! 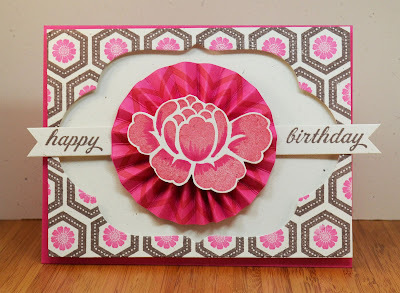 I love your bright pink rosette - I'm a big fan of that color too - lots of impact! Very pretty! This is perfect in every way! Lov e the hot pink hexagons, and the Rosie posie on a rossette! Stunning! Wow! You are in it to WIN it, girl! Love the cards you've created for the anniversary contests so far. Love the colors on this one, and the way you've used the Rosie Posie set. I didn't pick up that set, but every time I see it used by someone, I regret the decision! I'll have to pick it up sometime. You made such a cute background on the card! Your blog is a new one to me and I look forward to seeing more of your work. Thanks! gorgeous card. love the background you stamped.